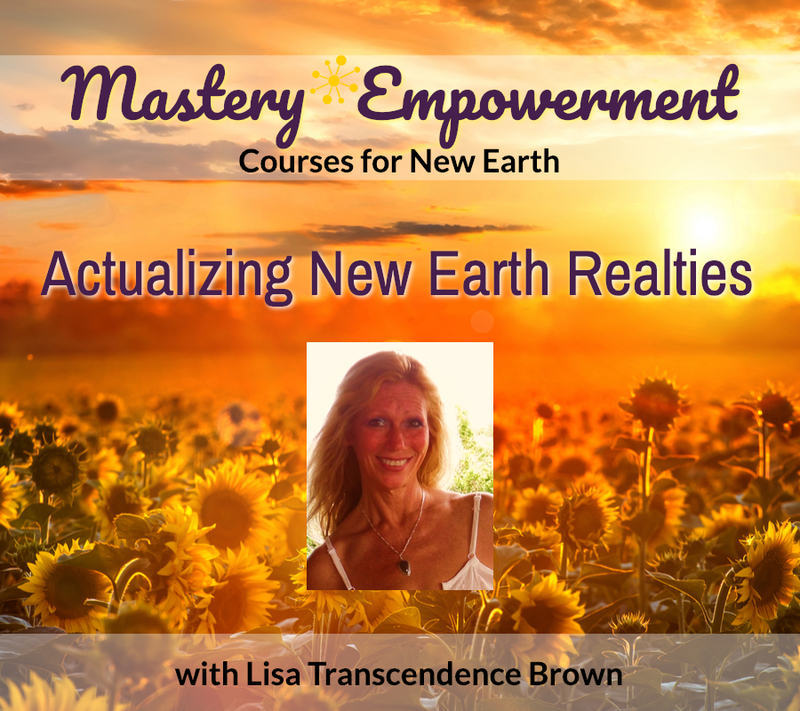 This amazing and phenomenal event with Lisa Transcendence Brown is now available for download in digital video or audio. This was a total of 10-hours with Lisa, and it will continue to work with you in your dream space and sleep space as you collapse old timelines and rewire yourself for New Earth. If you are ready to advance your understanding of how to BE and DO in Higher States of Consciousness…we invite you to experience this course for New Earth. You’ll be adding your energy to our group vibration and receiving ours in return from the Quantum Field! NEW Earth is born/birthed from within you and you bring it forth to create all new realities here. It’s a completely different reality (infinite ones), than you once “thought” you were here to do/be/live/experience….. NEW Earth is awakened within you, through your own higher dimensional levels of consciousness, through your wide open heart, through your wide open mind and through an intricate process of DNA RE-WRITES that occur as you do the “opposite” of the 3D ways…..
NEW EARTH IS a QUANTUM EXISTENCE…. is your/our Ascended Earth – Experienced in a multitude of ways, all non-linear…..
NEW EARTH COMES FORTH as you, as your Higher Selves/Soul, awaken/emerge from within you, through your Kundalini/LightBody/Energy Body activating and working through every cell of your physical body to recode, re-calibrate, re-structure your whole body, systems, structures and how you function/where you function from…. an immense purification process to clear linearity, density, programming and “imprints” encoded and housed/held in place by your deeply embedded ego-matrix constructs…. Re-alignment and re-structuring of your “REALities” is an immense process that occurs by way of the activation of PHOTONIC LIGHT… This PHOTONIC LIGHT is pure Source Consciousness, it’s living, breathing DNA/RNA, it’s the Light of your Soul/OverSoul and every “level” of Consciousness that you “truly are”, farrrrrrrr and wayyyyyyy beyond your human ego aspect here. LIGHT ENCODED INTELLIGENCE is in your Multi-Dimensional/MUCH Higher Consciousness DNA, which is activated vibrationally, through frequencies, tones and ENERGY, as well as through your experiences, which serve a multitude of purposes here. These “experiences” are a vibrational response to what you hold, unconscious/karmic timelines/realities that “need” to be cleared, your akash (on every level and there are many), as well as all of your brilliance, purity, gifts and abilities that lay dormant until you activate and utilize these, in conjunction with your own higher consciousness wisdom/guidance that opens up portals of immense possibilities, potentials and opportunities for you to utilize your FREE WILL (CHOICE) TO EMBRACE the NEW fully…. and leave the old mindsets/perceptions/limits/beliefs completely…. as you are here to completely RE-CREATE your REALities, in order to activate, anchor and experience your DREAMS in your physical (HEAVEN ON EARTH), TO ACTUALIZE THEM…. by way of BEing your highest consciousness you and coming to live, exist, work, function in/from UNITY, Pure Joy, Pure Love, Simplicity, Kindness, Consideration, Openness, Sharing, Supporting, while no longer supporting the old, which is how all is allowed to “continue”, because your ego aspect kept it going from a place of fear, judgment… a distrust that occurs from a place of separation held within. TRANSCENDING ALL SEPARATION means re-connecting from your own Deep Soul Level inside and learning everything all over again. NEW EARTH is a whole new Value System, a whole new Everything…. it is experienced by your Quantum You, which emerges as your human aspect fully surrenders to your Soul/Higher Self you…..
NEW EARTH is Ascended Earth, where you begin to LIVE as a Multi-Dimensional here. It’s your ability to see, recognize and decide what’s appropriate, whats aligned, what’s in-tune harmonically through Purity and what is not, and your Response-Ability & Cap-Ability to tune, shift, and completely bring all realities in to a much higher state of consciousness yourself. NEW EARTH is a Multi-Dimensional Earth, that is always available to all who are truly ready for this experience…. and is the GIFT we gave ourselves, yet we have to “earn it”, as it’s not handed to us on a Silver Platter… and all “entitlement” energy has to go. Once/AS we “learn”/allow ourselves to surrender, reconnect, play like an innocent child and REMEMBER the purity, ease, simplicity, PURE PEACE and JOY… then it’s time to start to step up to fulfill much higher purposes/missions/roles for all of HUmaNITY here. This innocence, magic and wide-open purity opens up “portals” to all “new” realities for us all…. and is a process of realigning our entire lives here. WALKING IN A DREAM becomes our “new” for awhile. As we acclimate, integrate and LIVE HIGHEST CONSCIOUSNESS with our every breath, our entire reality BECOMES a DREAM… that supports us, our service to HUmaNITY and all multi-dimensional realities too. (Just not like any one of us “thought”, which is why all judgments and limited perceptions have to go). Gaia has a new template now in place. A 12D Divine Template that re-distributes all on a Quantum Level, allocates all VIBRATIONALLY and non-linearly…. which is nothing like the old ways of 3D Consciousness, which is the “opposite” of how our realities work here. 3D was separation, ego and unconscious linear programs/mentalities and heavy density (emotions/mentally/physically), all suppressed and held in place by each, due to limited ability to see and understand, because our hearts have to open enough for “any of this” to become visible. First in the dream (sleep or waking day-dream) states, then more and more in the waking state as each fully opens up to ALLOW, the process of DNA/TEMPLATE rewrites/reconfigurations is a SOUL DECISION, not a human one. The amount of density that must clear, the amount of illusions and distortions that must become visible is immense. And the complete RE-EDUCATION that we all go through to awaken, bring forth and understand our highest states of consciousness is EXPERIENTIAL and through LIGHT CODES…. that can be “received” in a multitude of ways. First, WE must be completely open to this, or WE are the resistance…..
Join us for this Mastery Empowerment MasterClass to touch on a wide range of topics that are all part of the EQUATION, and to discuss the “hows” for opening up more, listening more, allowing more, choosing more, embracing more and shifting more…. AS YOUR HIGHER/HIGHEST SELVES, as your own Soul Self, your Multi-Dimensional Quantum YOU that exists BEYOND all of the previous mindsets, limits and beliefs “once” held. We discuss how everything is a matrix program, how each’s individual matrix system works, how to identify/understand an accelerate these processes and phases with greater ease, grace and as LOVE. Processing Speeds dictate how “fast” or “slow” all occurs (Quantum is Instant). Density slows this process down. How Acceptance is KEY, while other “acceptance” is no longer possible…. Building and creating a whole new FOUNDATION for your REALities and emanating/working from this place/space…. The processes of going offline and disconnecting from the old matrixes and grids and coming online with the Crystalline Matrix/Grids and networking systems of NEW Earth NOW/HERE. NEW COMMUNICATION: Energetic, Light Codes, Telepathy and beyond words (Words are only used when teaching, synchronizing and accomplishing with greater ease. Words are different here…. Every word is vibrational and transmits a reality, so we take great care in every word breathed…. the same goes for thoughts, emotions… all energy that is formed for purposes of delivery and how all is received and all through Purity… which transmits clarity and very different signals than the vibration of human words. Every word and phrase has Encodements embedded, as does each’s body/field/energy, which is “read” through the Unified Field of Full Consciousness, where words don’t matter/are not necessary, unless there’s a specific purpose/point. Everything is signals, codes and data…. that is “read” and not visible to our human aspect, yet to use as Light BEings, this is how we function… which is very different than “the old” and a part of all of our Evolution here as Light BEings in form. Our return to an organic, living Consciousness life where all is connected, affected and unified as ONE. A pure existence not tainted by human ego distortions anymore, where all are an integral part and contribute to the much bigger picture for us all here…. WE Each “do” this from within us, which is how all shifts on a collective level and WE BEcome the “New” (Individually and together)…. as LOVE… fully connected again as Souls and StarBEings, LightBEings in form here. How NEW Earth is full and infinite abundance. There is not one ounce of “lack” here, because of how we live/exist…. How you do have to “let go”. You can’t have both. You do have to choose NEW EARTH or the ride/transition is beyond uncomfortable. Photonic DNA Evolution will challenge everything you once believed, challenge every part of your human aspect and re-work all for you too…. This is a magical, surprising and brilliant, rewarding and pure heart expanding experience, once you embrace fully (and go all-in) too! This entire program is Light Encoded and a Key Code Activator through Avatar Consciousness Codes transmitted and received.